Goodman Snow Services can help keep your commercial property safe with snow plowing, sidewalk clearing, anti-icing and de-icing services, snow relocation and full blown winter risk management services. We are a locally owned and operated snow removal company providing comprehensive snow and ice management services across Central Ohio. We service any size commercial, industrial or municipal property including offices, shopping centers, industrial properties, hospitals and healthcare facilities, retail stores, and municipalities. Plowing is where it all begins. The first step is to prepare a Snow Management Plan tailored to your property. This plan is our road map to how we will handle every winter event from a minor salt event to a blizzard. These plans include maps of important information such as fire hydrant locations, handicap parking spots, sewer drains, snow piling locations etc. We take the time stake all curb lines and other hazards that may be hidden under a fresh blanket of snow during our pre-season inspections. Utilizing our fleet of truck mounted plows and loaders equipped with push boxes, we set out to clear you property from edge to edge of all snow. Sidewalks are the biggest liability on your property. Hundreds or even thousands of customers and employees visit your property every day. It is our job to make sure they can walk safely without the hazards of snow and ice buildup. Our dedicated sidewalk crews monitor your sidewalks throughout the storm and continually clear snow and apply ice melting agents in order to keep your walkways, stairs and entrance safe and slip free. Using a variety of local and paid weather services, our management team closely monitors impending winter storms. Hours or even days before a forecasted event, our crews are out applying a layer of liquid anti-icing product to your walkways and parking areas. Our liquid products coat the surface to help eliminate the bonding of snow and ice at the onset of the storm. By utilizing advanced liquid technology, our crews are working for you before the first flake flies. It is our duty to ensure that our client’s properties remain completely safe through the duration of the event. With over 500 Tons of bulk rock salt stored through-out our service area, our crews always have the material they need to properly handle any level of winter event. Our dedicated sidewalk crews use a combination of granular ice-melt products and liquid de-icing agents to maintain wet sidewalks throughout an event. Our liquid de-icers do not track into your facility like traditional products do. There is nothing worse than having your freshly cleaned carpets stained white with salt residue! 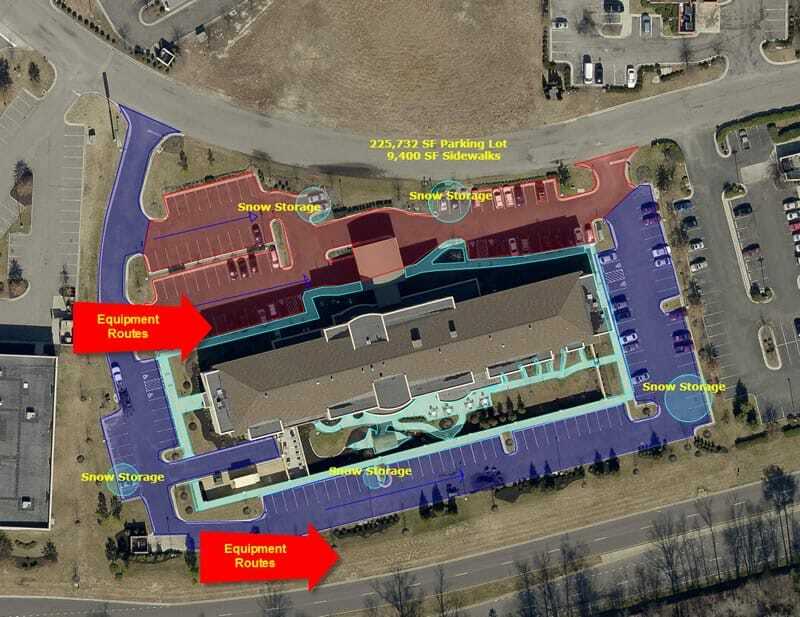 It is our goal for your property to maintain 100% of its parking area throughout the winter. This is achieved by only piling snow in designated areas and NEVER on parking islands or around light poles. After large events, it may be necessary to stack or relocate snow on your property to allow room for future events. We are also equipped to haul all the snow off of your property to a designated snow dump site if required. According to The Centers for Disease Control and Management, one million Americans are injured and 17,000 die due to injuries sustained in a slip and fall incident. With all of our services, Goodman Snow takes a proactive approach to ensure safety on your property and minimize all unnecessary claims and lawsuits. There is nothing worse than trying to contact your service provider and then being sent straight to voicemail. Better yet, waiting hours for your voicemail to be returned. Goodman Snow provides multiple paths of communication 24/7 during a winter event. Using a mass email system, our management team communicates with clients when a storm is on the horizon. In this email we let you know predicted event start times, forecasted accumulations and our plan of attack. Every property is assigned a property manager. This team member acts as the liaison between our clients and the boots on the ground. Our property managers are well educated in the intricacies of assigned properties and can quickly address any questions or concerns. We use state of the art CrewTracker software to capture service start and stop times, quantity of materials used, weather conditions and images of our crews work. Clients can use a secure portal to view real time progress on their site(s). Invoices are sent moments after the service is complete. No more waiting weeks or months for invoices! After every event, we send a detailed record of services performed on your property and verified snow totals from our weather providers. Your property manager will reach out to you to ensure all services were completed to your satisfaction and discuss any other services that may be needed such as snow stacking and relocation. Fill out the quick form below to get a proposal for servicing your property. Goodman Snow Services, LLC provides professional snow and ice management services for commercial, industrial and municipal properties in Central Ohio. We approach snow removal with a risk management philosophy and can provide much more than just snow plowing services to keep your property safe from winter snow and ice.